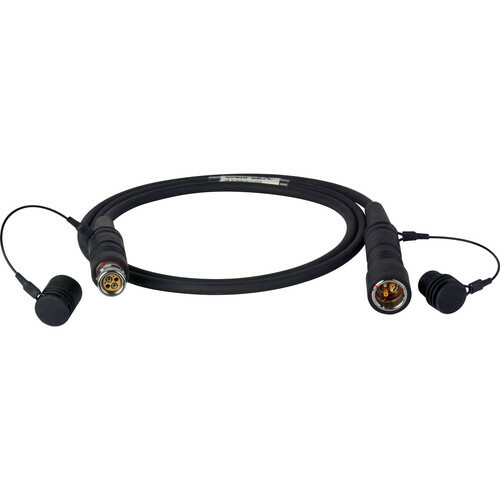 Ideal for portable deployments for truck and camera connections when facing weight and space constrictions, the Camplex HF-FUWPUW-7 Mini SMPTE cable assemblies with Gepco cable and Lemo FUW-PUW connectors are smaller and lighter than traditional steel strength member cables. The steel is replaced by a Kevlar strength member that has the same pull strength of steel, but is lighter and more flexible which means they lay flat and are easier to deploy and reel back on the drum. Kevlar expands and contracts at the same rate as the glass members during temperature extremes, keeping the elements in the cable aligned reducing migration. The power conductors consist of two 16 AWG conductors so you can still achieve the same distance a regular SMPTE 311 cable performs to. The Gepco cable also features bend insensitive fiber to reduce optical loss when bending and handling making them ideal for use behind racks and in trucks where space is extremely limited. The master jacket of the cable is heat resistant polyurethane, which is tougher than PVC for rugged outdoor use. Lightweight, flexible, and rugged Camplex Mini SMPTE 311 camera cable features 16 AWG robust power conductors for high performance in portable applications.